It’s been over 3 months since we purchased our used car. In that time, we’ve had the ability to get used to a new type of budget, one that has a large monthly expense in insurance and fuel. It hasn’t been that big of a change for us, as we were saving pretty heavily for the car before we bought it, but each month seems to be a little tighter than it used to. One of the reasons for this is because of some of the unexpected vehicle expenses we’ve come across. 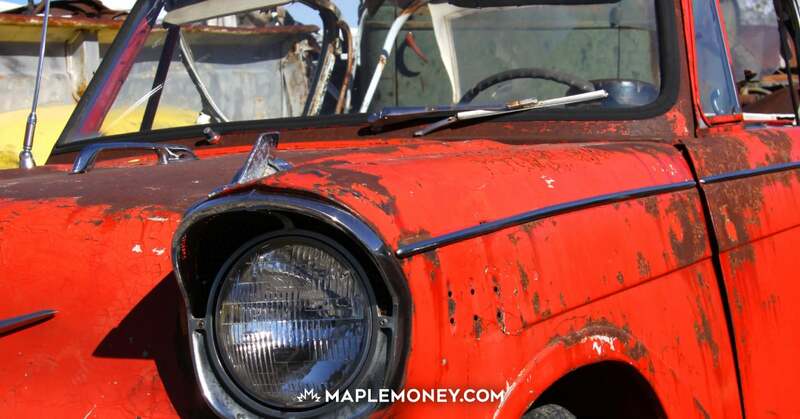 From potential brake problems to oil changes to chips in the windshield, we’ve had nothing but money draining incidences since we purchased our vehicle. About a month ago one of our brakes made a weird grinding noise. We waited and listened for more sounds, but didn’t hear anything, so we shrugged it off. However, over the last week the grinding sound had returned. We found a mechanic willing to take a look at it, and he said he didn’t find anything that might contribute to that noise. During the inspection, he cleaned out the brakes, and we haven’t heard the noise since, so hopefully that problem will not arise again. One thing that we already did have to get fixed, however, was a small chip in our windshield. I’m not entirely sure when we got the chip, but seeing as I drive on the highway to work every day, sometimes behind large gravel trucks, I’m not entirely surprised one stray rock managed to take a chip out of our windshield. Luckily it was easily fixable. This will prevent the chip from cracking and making the damage worse, but when I set up an appointment for it to be fixed, I found out it was going to cost $90. While that isn’t a terribly large amount of money, it is definitely one of those unexpected vehicle expenses that I just wasn’t planning on. To make matters worse, literally the day after we got the chip fixed, I noticed another one. I have no idea how it happened, but this one looks even worse, and has already started to spread. If we don’t get it fixed right away, it could split the windshield further, causing us to completely replace the windshield at a cost of around $600-700! One of the more expected expenses was an oil change. I knew that we would be changing the oil on a regular basis – I guess I just didn’t realize how regularly. We made a trip out to visit my parents, and in doing so, went through quite a few of the kilometres before the recommended next oil change. So all of a sudden we were only 100km away and needed to get the oil changed. Again, it is not a huge expenses, but at $40-50 per oil change, it is nothing to easily brush aside. It’s just something that I wasn’t quite expecting, but will be more aware of in the future. While we most recently got the oil changed, the mechanics did a quick visual inspection and let us know something that we actually had been expecting. Our tires are worn out. When we bought the car we were told that the tires would have to be replaced in the fall, so I guess now that it is September we will have to get the tires changed. This is a more expected expenses, but at about $700 it is a fairly substantial amount of money to be putting into our vehicle so that we can continue driving around on a daily basis. However, it is far better to spend some money keeping a vehicle safe rather than getting into an accident because our tires can’t cut through water. So we went to Costco (as recommended by our mechanic) to get some new tires. They have some very high quality tires there, and for a very good price. So we go to the Tire Center, give them our make, model, and year of our car, and they confirm that they have the tires we were looking for (Michelin Primacy MXV4). So we go wandering around Costco while we wait, and get a phone call. Apparently they don’t have the tires that we wanted. They do have the same model, but just the size bigger (wider, by about 1cm). They said we wouldn’t have a problem with the larger tires, but they did cost more. Seeing as how our current tires were becoming dangerous to drive on, we decided to just get the larger tires. It’ll be interesting to see how this might affect our fuel economy, but hopefully it won’t make much of a difference. All our friends told us, pre-owning a vehicle, that they cost a lot more than just gas and insurance. We knew that we would have to pay for some maintenance, but I guess we just didn’t realize how sometimes, all these expenses can come at once. Lesson learned. What unexpected vehicle expenses have you encountered lately? My Mazda6 hit the 84K mark after 3 years (lots of driving to the east coast). That aside, after returning from our yearly trip to PEI, I had to get my oil changed. Went in expecting to spend $50, but came out $270 later. We needed the oil changed, battery changed, and coolant changed. Oh well, I guess it is part of car ownership! Y’arg. Mind you, I must say Mr Lube is a great place. They broke a T valve that is on the coolant system, so they replaced it free of charge and the replaced my coolant for free. I had to get my brakes fix once and it cost a lot more than I was expecting. Always be prepared cause cause maintenance costs. A couple of things about changing tire size from a mechanic. Changing the width of a tire affects the height and therefore the circumference of the tire. This means that you speedo may be out by at highway speeds. No problem if you always go exactly the speed limit, but you should be aware of it. You can check the effect tire size has on you speedo here. Just a heads up so one of the other unexpected expenses doesn’t come in the form of fines. I would argue that both used and new cars will have regular maintenance costs, and replacement costs for parts that wear out. Yes, new cars will most likely have a few less of these costs, but in the long run a used car will still cost you less in most cases. I think these “unplanned” expenses just needs to be added as an extra line item that needs to be budgeted for. Plan ahead for those expenses because they WILL happen. A car is not an investment. I love our 2002 acura. Great on fuel but where I used to park there was a lot of street traffic. Worst part was having my vehicle broken into once and the right mirror broken. What a pain to replace. Unfortunately, owning a new or used vehicle comes with all sorts of fun unexpected expenses. I live in a state in the U.S. that requires annual inspections. If your car does not pass, you can’t drive it until it gets fixed. Just last month, I had a small power steering leak that cost me $600 (US) to get it fixed just to keep driving it. The car is almost 9 years old so I am hoping it can last several thousand more miles. Unexpected car repair expenses is really one of the biggest killer in a family’s budget. Most people use credit cards to pay these expenses while others who are disciplined enough to have an emergency fund are able to tap that. I find with my 2005, brakes, oil and tires usually happen all at once. Last summer the AC stopped working too. Still cheaper than a new car though! Well Alan, you’re still ahead financially by buying used. Are you ahead in peace of mind? It’s difficult to tell when the repairs are getting excessive. For us laypeople it’s difficult to gauge the true condition of a car. I get peace of mind by leasing, but that has other implications like worrying about excess kilometres and maintaining the car in proper condition. Windshield Tip – I had a lease, or fleece, and got a nice big chip from a stone on the highway, sure enough it cracked the height of the windshield and it was in the last year of the lease. I got it replaced with a used windshield for $399 a week before the end of the lease. If you entire car is 4 year old used parts, why replace a non-wear item with a new one. No issues at lease return time either. Can’t say I was that lucky with brakes on that same car, they wore excessively and early. After all monthly expenses including food, savings, and bills, im left over with around $1000 for car expenses and fun money. How much could I comfortably set aside for car expenses?